England fans watch the World Cup at Ye Olde King's Head in Santa Monica, Calif. It's about to be a long, sad match for them. 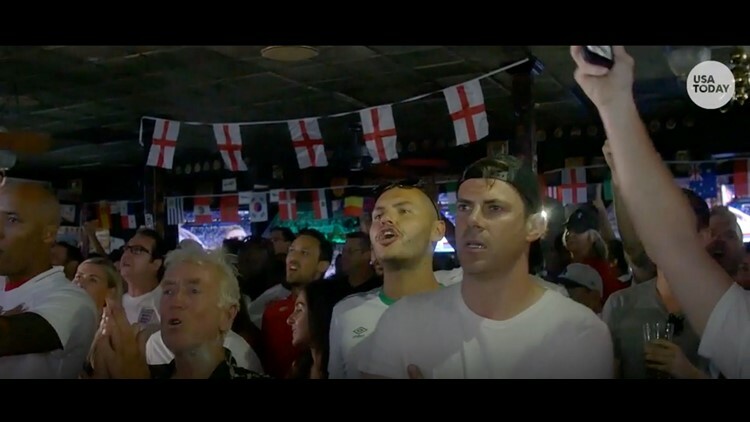 SANTA MONICA, Calif. – If you were to ask me to describe the Ye Olde King’s Head pub on Wednesday morning, I’d tell you it was the perfect, cheeky spot to watch the England v. Croatia semifinal. Why? It serves beer when it opens at 9 a.m. PT, plays World Cup songs before the game starts and it’s a cozy space where no one frets over a spilled pint. But if you were to ask me about the same pub on Wednesday afternoon, I’d tell you it was a dark, hot, depressing dungeon of tears and sticky floors. At least that’s what King’s Head, the famed pub in Santa Monica that is the home-away-from home for Los Angeles-based Brits and die-hard World Cup fans, became when England went from leading 1-0 to losing 2-1 in extra time. It's one of a number of bars in America that caters to a largely-English crowd. Their customers might not necessarily invade an IKEA in sports celebration, but would be down to crowd-surf at the bar (as happened in King’s Head before) or sing “God Save the Queen” while holding up a replica World Cup in a Freddie Mercury mask (as has happened in Brooklyn’s Banter bar). And so, even though USA isn't in the World Cup this year, lines to get into these pubs can run down the block, the bar can reach capacity and a game-heavy day can bring in three different waves of fans. But it's less awesome when England loses. Here's what happened Wednesday at King's Head when Croatia upset the lads. 9:30 a.m. The fight songs commence. After fans are let in and the bar easily hits capacity (with wait staff adding velvet ropes to ensure they have a path to and from the bar), the singing begins. The King’s Head playlist includes these English crowd pleasers: “Vindaloo,” The Clash’s “This is England,” Monty Python’s “Always Look on the Bright Side of Life” and Chumbawamba’s “Tubthumping (I Get Knocked Down),” which gets cut off, to boos. “Three Lions (Football’s Coming Home)” is played more than once. As Londoner Rupert Wilson explains, the song was at first a joke because fans had no hopes of getting to the World Cup finals. But now, the catchy song has become a serious rallying cry with England competing in the semifinals. Another tip from Wilson: Don't pronounce the "H" in "Home" when you sing it. 10:45 a.m. One more cheer before we start. 11:36 a.m. The mood changes. The excitement from the first goal is long gone as fans are worried about retaliation. “They missed three shots!” a burly dude says on repeat, then corrects himself: “They missed four!” The Irish guy next to me starts rolling a cigarette. There are shouts of relief for the end of the half followed by a mass exodus for the bathroom. I ask people if they’re skipping work to see this midday match. “I took off three weeks of work for the World Cup,” one woman says. “I called in sick,” says another. “I swapped shifts with someone,” a man says. A few other spectators are traveling, unemployed or otherwise off work today. This is Los Angeles, after all. 1:10 p.m. Everyone’s still stressed. A white-haired man in an England scarf looks like he’s about to cry before cussing at the screen. A disgruntled fan can’t find a decent path to the bathroom. “Can I go the the pisser?” he loudly asks. Someone tries to lighten the mood with a cheer: “COME on, EngLAND,” he says in an almost Cockney accent. 1:21 p.m. Someone accidentally turns on the music. In a bizarre move, an employee seems to accidentally play random pop music that has nothing to do with the game. Attendees boo the music and then realize, that, wait, did Croatia just score? Croatia just scored?! The bar goes quiet. Waitresses are transfixed on the match. Bartender Raul keeps staring at the screen and petting his beard. 1:38 p.m. Croatia scores again. Tears come. It's over. It’s quiet. One man puts his head in his hands and keeps it there for a minute. The place quickly clears out. There are tears and sad hugs. Fans walk out of the formerly lively pub, which has become a sweaty room with not enough windows, and brace themselves for the hot sun. People don’t want to talk. They’re pissed. At least no one's fighting. Someone mocks the fact that I'm asking questions and sarcastically says he's going to go home and eat "crumpets and tea."